A trade war between the US and China has been heating up this year, with the US levying tariffs on $US250 billion of imported goods from China and China retaliating with tariffs on $US110 billion of US goods. 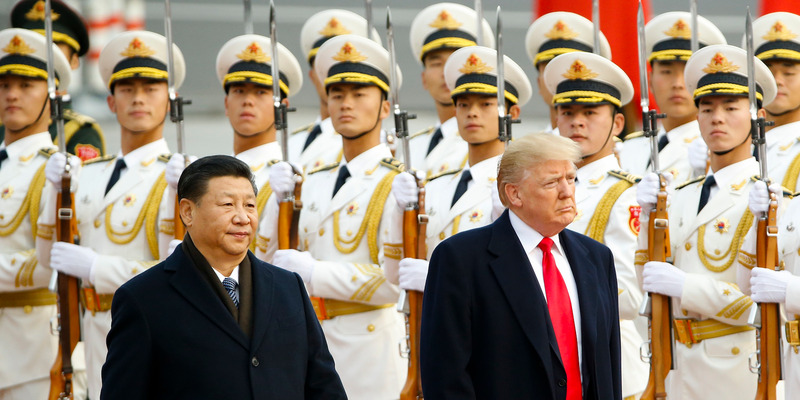 President Donald Trump’s administration has levied tariffs on a total of $US250 billion of imported goods from China. That represents about half of all imports from China. China has retaliated by announcing tariffs on $US110 billion of US exports. Both Trump’s tariffs on China and China’s retaliatory tariffs are likely to impact the economy in various ways. At the most basic level, tariffs increase the prices of goods, directly by making imported goods more expensive via the imposed tax, and indirectly by allowing domestic manufacturers who do not have to pay the tariff to charge higher prices. Indeed, that latter effect is the main argument in favour of tariffs: By being able to charge higher prices, domestic producers can theoretically become more profitable and invest more in factories and workers. For example, Ford says that a separate set of tariffs on steel and aluminium imposed by the Trump administration this spring will likely cost the automaker $US1 billion, according to a CBS News report. The most recent set of tariffs against Chinese imports, which went into effect at the end of September, targeted around $US200 billion of goods with a 10% tax scheduled to increase to 25% on January 1, 2019. Those tariffs could have an even more direct impact on Americans’ wallets than the earlier round of tariffs, which were mostly against industrial products and intermediate goods. “We don’t know for sure how quickly importers will raise wholesale prices of the affected items, or how quickly manufacturers of substitutes for Chinese products will lift their prices,” Sheperdson wrote in a note to clients. Walmart included a list of specific items that it’s particularly concerned about, including luggage, gas grills, and HDMI cables. Jay Timmons, the National Association of Manufacturers’ president and CEO, called for increased trade talks to cool down the trade war. “Now is the time for talks-not just tariffs-and manufacturers have laid out a blueprint to reset the US-China commercial relationship that will result in ending China’s unfair and anti-competitive behaviour,” Timmons said. 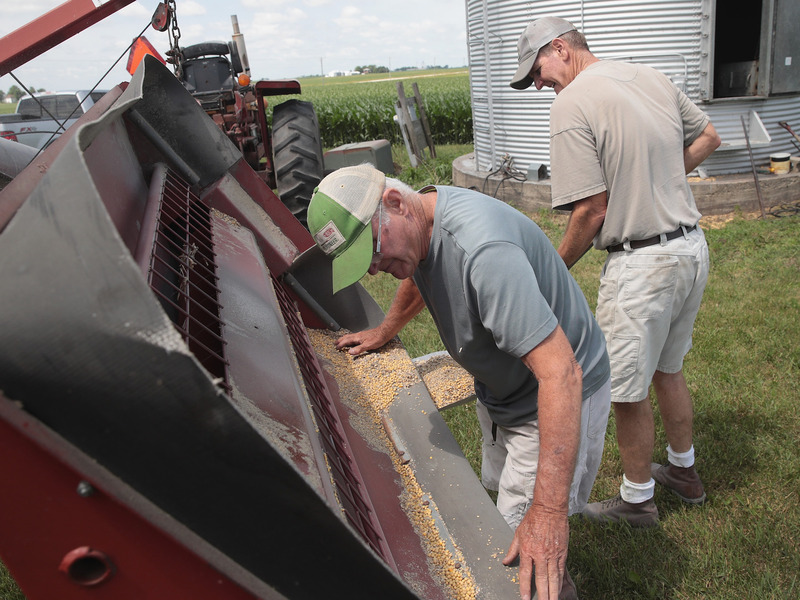 Scott Olson/Getty ImagesFarmers are at risk of being hurt by retaliatory tariffs against agricultural goods like soybeans. Casey Guernsey, a seventh-generation farmer and spokesperson for Americans for Farmers and Families pointed out that the uncertainty surrounding the trade war could interfere with farmers’ plans for the future. “The real negative isn’t that – it’s confidence, consistency. If people start reducing investment, if people start moving their supply chains around, that we have seen already moves the markets a little bit,” Dimon said. 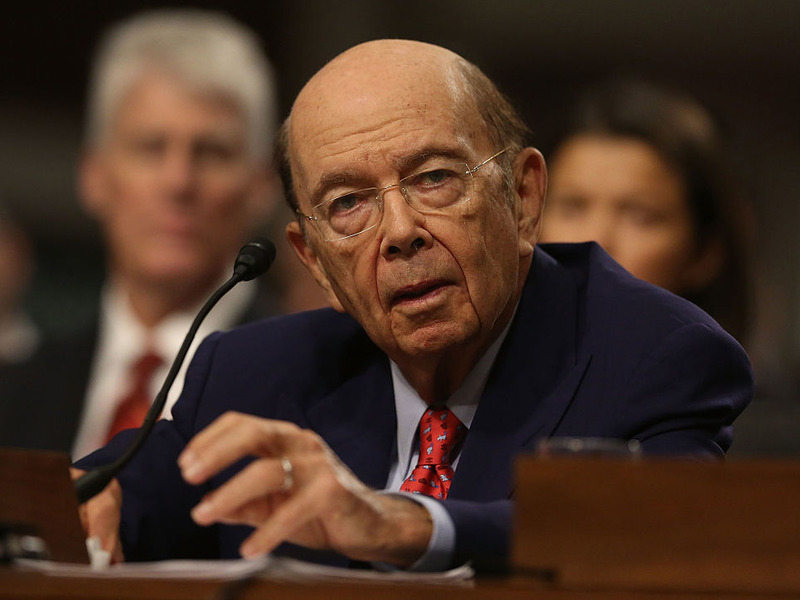 Joe Raedle/Getty ImagesCommerce Secretary Wilbur Ross has defended the tariffs. As a response to the September round of tariffs, China imposed retaliatory tariffs on about $US60 billion of US exports to China, representing about 85% to 95% of the total goods export trade from the US to that country. The full impact of a trade war between the US and China is likely to be felt across the country, but unequally among different states. 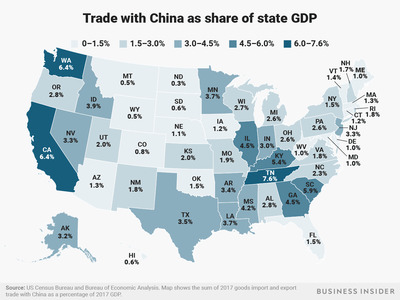 Total goods trade with China – both imports and exports – adds up to 7.6% of the total size of Tennessee’s economy, and 6.4% of each of the economies of California and Washington state.